Is there an ideal standard of facial beauty? A recent article reviews the history of beauty ideals and how they may affect cosmetic dermatology. DaVinci described facial harmony in terms of the distance between segments of the face as if the face was divided into horizontal thirds. Classic beauty meant that the thirds were of equal proportion. Modern day beauty challenges that norm, especially after noting that the sizes of each third vary by gender and ethnicity. However, a recent survey found that compared to average women, celebrity faces showed uniformity between the facial thirds. Others looked at the lower face and divided that segment into thirds. When modern photographs of 105 attractive celebrity faces were compared to classical sculptures of gods and goddesses, authors were able to establish a ratio of the upper one-third to lower two-thirds of the face between the two standard-bearers of beauty for their time. Modern celebrity faces had a ratio of 69.8% in celebrity females and 69.1% in celebrity males; this compared to 72.4% seen in antique females and 73.1% in antique males. From this study, the authors concluded that a 30% upper lip to 70% lower lip-chin proportion may be the most appropriate to describe contemporary standards of attractiveness. The face can also be divided into vertical fifths and there are standards that apply to that measurement as well. Again, equal proportions tend to mark what is considered beautiful in art and popular culture. These aesthetic “rules” come into play when thinking about cosmetic alterations of the face through fillers, skin tightening, among other cosmetic enhancements. 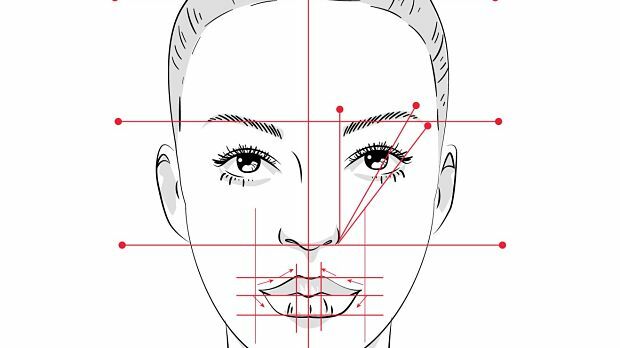 Rather than trying to assist patient in achieving a particular standard, understanding facial harmony can provide practitioners with a framework. The authors of this paper offer this history as a way of conceptualizing norms of ideal facial dimensions, in order to maximize aesthetic results when considering alterations to individual cosmetic units of the face.